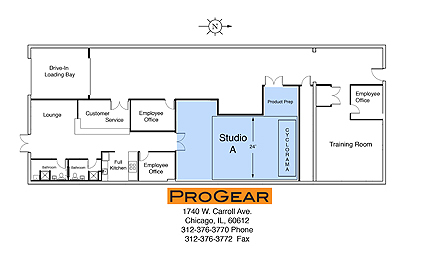 The ProGear rental studio is backed by a large assortment of photographic equipment and supprt services for your studio shoot. All equipment rented for use in the studio must be reserved in advance and will be made available under our normal terms and conditions. Special requests are no problem and will be handled promptly. The “cyc” is part of the studio rental fee, it will be freshly painted white upon request. A deposit of 50% of the rental will be due at the time of reservation to guarantee the studio for the dates reserved. 1200 Sq. Ft Shooting area – 12 ft. Ceilings – Cyclorama – Hi Speed Private Wireless – Sound System – Kitchen – Free Parking! !